Grip Racing is a Street friendly flywheel, which is considerably lighter than stock and is the most durable flywheel. Materials are properly distributed for maximum strength, lower inertia, good heat tolerance and durability. Grip Racing flywheels are recommended for street or drag racing. Feel: &###xA0;Noticeably improved engine response and acceleration, OE to mild gear rattle. Life: &###xA0;Heat-treated forging for strength and toughness, induction-hardened ring gears for maximum life. Quality:&###xA0; One piece construction allows less opportunity for failure and provides uniform efficient heat transfer from the clutch disc. No more warped inserts or loose ring gears. Recommended Use: &###xA0;Recommended for street and race use. Benefits:&###xA0; Forged, CNC machined and dynamically computer balanced for smooth high RPM reliability. 2002 - 2006 Acura RSX Base; TYPE-S (2.0L 4cyl; fits all model; base model, Must use Rsx Type-S clutch kit). 2004 - 2008 Acura TSX (2.4L 4cyl, Must use Rsx Type-S clutch kit). 2009 - 2014 Acura TSX (2.4L 4cyl; must be used with Hondata Flash Pro, Must use Rsx Type-S clutch kit). 2003 - 2012 Honda Accord (2.4L 4cyl, Must use Rsx Type-S clutch kit). 2013 - 2014 Honda Accord (2.4L 4cyl; must be used with Hondata Flash Pro, Must use Rsx Type-S clutch kit). 2002 - 2011 Honda Civic Si (2.0L 4cyl). 2012 - 2015 Honda Civic Si (2.4L 4cyl; must be used with Hondata Flash Pro, Must use Rsx Type-S clutch kit)&###x200B;&###x200B;&###x200B;&###x200B;&###x200B;&###x200B;&##x200B. &###x200B;&###x200B;&###x200B;&###x200B;&###x200B;&###x200B;&###x200B;&###x200B;&###x200B;&###x200B;&###x200B;&###x200B;&##x200B. Any product you return must be in new condition and in the original packaging. If you are 100% satisfied with you order, please rate us 5 stars. Thank you for supporting our family owned business. If for any reason you are dissatisfied with your order please get in contact with us before us leaving feedback and we will do whatever we can to help. SFI CertifiedGRIP Flywheels are designed and tested to ensure the safety and quality of every flywheel. Years of R&D has given us the knowledge and firsthand experience to choose wisely the best material to manufacture flywheels that will surpass your expectations. The majority of GRIP flywheels are made from 4140CHROMO/5140CHROMO STEEL. GRIP Flywheels are SFI Certified meeting performance standards for the automotive and motorsport industry. &###xA0;Benefits of a GRIP RACING 11LBS Light Weight flywheel:Light-weight for improved for better performance and Quicker Rev&###xE2;&###x20AC;&###x2122;s.
(Aluminum&###xA0;Flywheels) Consist of a replaceable heat shield (friction surface), eliminating need to resurface flywheel. Reduces major turbo &###xE2;&###x20AC;&###x153;lag&###xE2;&###x20AC;&###x9D; in turbo-charged engines. Increased supercharger efficiency due to less drag on the crank. Improved mid-range torque in naturally aspirated engines. Professionally CNC Machined and balanced. Extended longevity&###xA0;CAD designedSFI Certified. ABOUT USWe not only value our customers but we also value their needs and demand for a quality car part. Our Second goal was to provide car enthusiast with a critical car component at high quality and at an AFFORDABLE price. Most importantly, We believe that every car enthusiast should be able to experience some performance level in their car application at the right, affordable price. Quality and Affordability are our Key factors and beliefs within our company. Must be in original packaging and brand new. Items that have been used, installed, damaged, or altered are non-returnable. Damage Claims Any damaged merchandise received must file a claim with the carrier and not with GRIP Clutch. Clutch Break-in Period All PUCK CLUTCH DISC(S) need at least 500 miles for break-in. All KEVLAR DISC(S) need at least 1000 miles for break-in. All FULL FACE ORGANIC DISC(S) need at least 200 miles for break-in. The item "GRIP RACING USA CHROMOLY FLYWHEEL HONDA CIVIC TYPE R EP3 FN2 K20 INTEGRA DC5" is in sale since Monday, March 21, 2016. 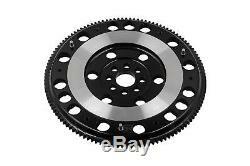 This item is in the category "eBay Motors\Parts & Accessories\Car & Truck Parts\Transmission & Drivetrain\Flywheels, Flexplates, & Parts". The seller is "advancedclutchsolution" and is located in Los Angeles, California.